Well lookie what we have here! This one is a treasure, for sure. It is significant on several levels. First of all, what is it? This is my garter belt from my High School Senior Prom, worn on the big night in May 1995. 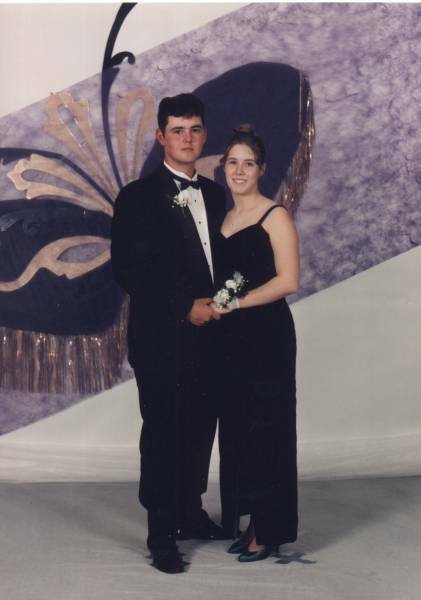 My date for the evening at the Heritage High School prom was my boyfriend, Corey Sundquist. Why is it significant? It has a Black Rose. That was my nickname in high school. I instantly fell in love with this garter and HAD to have it. I bought it at the mall a few weeks before prom and wore it under my prom dress. Incidentally, my hunter green velvet prom dress is also a family treasure. It’s stored in my closet. I had it handmade by a local tailor in Saginaw, Michigan. I picked out the fabric at Jo-Ann’s and picked out the pattern, and commissioned the tailor to make it for me. I wanted a dress that wasn’t like anybody else’s dress, and that’s precisely what I got. I felt like a princess in that dress. http://www.jessicagreen.com/wordpress/2012/01/05/treasure-chest-thursday-my-prom-garter/You must be logged in to post a comment.